Guarantee: Full refund if you are dissatisfied with the gift box. Exchanges accepted on items with the tag still attached. FANCHEST is a Brooklyn, NY based company that was started in 2015. They curate gift boxes that are themed around a particular sports team and mail them directly to your home. They work directly with the merchandising brands to provide high quality products for their boxes. FANCHEST offers free shipping on orders over $75 in the United States and has a few options for each team depending on the type of gift box you’d like to purchase. The cheapest option typically ranges around $49.00 and the most expensive can be over $200.00 per box. FANCHEST currently offers gift boxes for teams in the NFL, NHL, and NCAA but not all teams are currently represented in these leagues. Additionally, they are working on adding the NBA and MLB. If your team is not represented you can sign up to receive an email once your team is available. This is where FANCHEST surprises its’ customers. While you may see an image of what’s in the box online when you make a purchase, that isn’t guaranteed to be what you receive. Each box is a little different, but you are guaranteed to receive a specified amount of items based on the option you choose. It can be t-shirts, hats, pennants, blankets, stickers, mini helmets, banners, etc. The options can be endless, but they do state that the boxes are changed up every April and October which allows you to purchase more over time. Additionally, each box includes a Golden Ticket where customers can win VIP experiences, signed memorabilia, and much more. If you’d like to see a video of what items can show up in a FANCHEST, I’ve made a separate review video for you to check out. There is plenty to like about FANCHEST. They offer high quality sporting apparel and gear at a variety of cost points. In all cases, the value of the box is worth more than you end up paying for. One of my biggest knocks against them is not having all the 4 major American sports leagues covered yet, but that will come in due time. This company is only a few years old and will have so much more growing to do, so I don’t consider this a complete deal breaker. I think the type of products and service they provide far outweigh potential cons. 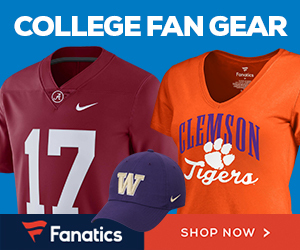 Overall, I would rate FANCHEST at 4.5/5.0 in terms of products and services offered as these specially curated boxes are a great gift option for the sports fan in your family. What a great idea these fan chests are. I am from the UK and as far as I know these are done over here, or if they are I haven’t seen them… maybe there’s an avenue for you to explore. Premiership Soccer Teams would probably be bought all over the globe. Thanks for your great review. Thank you Martin! I know FANChest is currently working to expand their offerings, my guess is they will focus on the 4 main US sports first but I think there would be massive potential for the global soccer market. I’ve recently become a fan of the sport so I know I’d like to see them offer that in the future. Great product choice will make great gifts for Christmas for sports fans. You have done good job using graphics to draw readers interest. I would suggest that rather than write as a canned commercial you share personal thoughts (both likes and dislikes). Writing in personal mode gives authenticity to your article. Thank you so much Barry. I’m hoping that the more reviews I write, the more I find my own voice as well but I appreciate your feedback. These little giftboxes were fun to research.